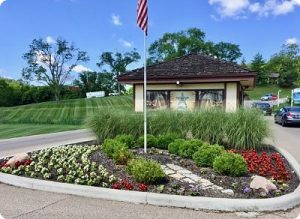 The Hidden Valley Lake POA provides private law enforcement, security and emergency services for the community. Reserve sheriff’s deputies, trained and deputized by the Dearborn County Sheriff’s Department, are on duty twenty-four hours a day, seven days a week. The Guard Station is located at 212 Hidden Valley Drive, at the front entrance. 812-537-3431 or 800-543-1149; Dial 1 immediately after number; Dispatch will relay your message to HVL deputies on duty. 812-537-9400; Your call will automatically roll to an HVL deputy’s cell phone. Poison Help Line: 1-800-222-1222 connects you to a specially trained nurse, pharmacist, or doctor at your local poison center. The call is free and confidential. People often get help over the phone and usually do not have to go to a doctor or the hospital. Poison Help website: Learn about your risks before an emergency. Find info about poisons, poison safety and prevention, and when to contact your poison center. Sign up for Smart911 and Rave Alert today. The HVL Security Department enforces traffic, parking and speeding rules throughout the Valley. To obtain an Indiana title check for a new or used car purchased out of state, you may go to the BMV in Lawrenceburg, or contact HVL Security at 812-537-9400. A deputy will verify the VIN number and provide you with the proper form to get your license plate. For your convenience, a deputy will come to your location to verify. Security will keep an eye on your HVL property while you are on vacation. Please complete and return the Temporary Address Change form, or contact the POA Office. Indicate “Vacation Check” on the form to enjoy peace of mind while you are away. These videos, produced by the Greater Kansas City Metropolitan Emergency Managers Committee (preparemetrokc.org), are designed to share important information in a fun, memorable way. They guide the viewers through various stages of preparedness and what to do in an emergency. These videos are presented by your HVL Safety, Security, and Elections Committee. Contact us at: safety.security.elections@hiddenvalleylakeindiana.com. Episode 1: Meet “Disaster” and “Preparedness”— two characters who will help you understand why you need to take personal responsibility to prepare yourself and your family for potential emergencies. How can you keep mayhem to a minimum when disaster comes calling? Put together a simple emergency kit now. Be prepared to take care of yourself and your family for up to 72 hours following a disaster. You never know when disaster will strike next. Protect yourself and your family by learning about the risks now, before a disaster happens. Find out what you need to do to create an emergency plan. It’s easier than you might think. Episode 4, Disaster and Preparedness: Should I Stay or Should I Go? You probably know what to do in case of a tornado or fire. But what if you need to evacuate or shelter in place because of a hazardous chemical spill? Take the time now to learn when and how to shelter in place, and when and where you should go if you need to evacuate. Disaster can knock out our normal communications methods. Without phones or electric power, what will you do to reach your family members? How will you stay informed? Create your emergency communications plan now, before disaster strikes. Episode 6, Disaster and Preparedness: What’s Your Next Move? Preparing for disaster is a little like a game of chess, but with more serious consequences. You never know what move disaster will make next — and disaster doesn’t always play by the rules. Get your game on by knowing the risks, having a plan and taking personal responsibility for preparedness. Don’t let disaster deliver a knockout blow. Learn how to make a plan, know the risks and stay informed. PrepareMetroKC.org puts resources in your corner that can help you put disaster down for the count. “Disaster” and “Preparedness” are back, with a new three-part video series that focuses on the different types of responses necessary for different emergencies. In this first episode of “Disaster Place Theater,” our Preparedness character walks you through important steps to protect your family during a tornado. In part two of the “Disaster Place Theater” video series, our characters focus on what to do — and what not to do — during a fire. This video is part of a series that focuses on the different types of responses necessary for different emergencies. In part three of our “Disaster Place Theater” video series, Disaster and Preparedness talk about chemical hazards and how to shelter in place. This video is part of a series that focuses on the different types of responses necessary for different emergencies.